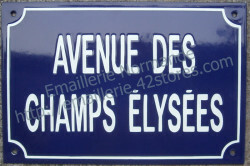 Traditional french enamel plaque, size 20x30cm. 4 holes to fix it. Available background colours : dark blue, green, black. Text & border : white. Traditionally handmade with stencil, our enamel signs are melted at 820°C. NOTE : -Colours shown on the pictures can be slightly different than the real colours.